Kanan Enterprises is recalling 14-oz. 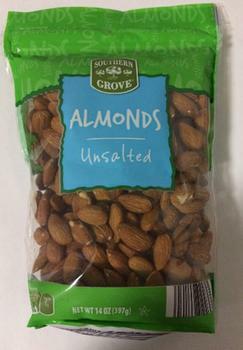 Packages of Southern Grove Unsalted Almonds. The product contains wheat and soy allergens not listed on the label. The recalled product comes in a 14-oz. stand up pouch bag with a UPC 0 41498 24647 1 and a date code of Best By SEP 25 2018 KN and was sold at ALDI stores in Florida, Illinois, Indiana, Kentucky, Maryland, New York, North Carolina, Ohio, Pennsylvania, South Carolina, Virginia and West Virginia. Customers who purchased the recalled product should not consume it, but discard it or return it to their local ALDI store for a full refund. Consumers with questions may call 1-800-860-5464, 8:15 am – 5:00pm (EST), Monday – Friday.